Contest: Win This Incredible Prize Package From Roland and Modern Drummer! 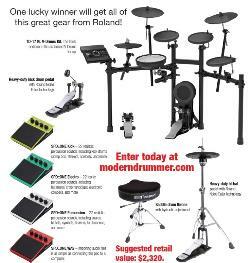 Win This Incredible Prize Package From Roland and Modern Drummer! Prize: Grand Prize: One (1) winner will receive one (1) of each: TD-17 KL V-Drum kit; RDT-SH drum throne; RDH-100 kick drum pedal; RDH-120 hi-hat stand; SPD::ONE Kick, SPD::ONE Electro; SPD::ONE Percussion; and SPD::ONE WAV. Statistics: This contest was opened by 140 and entered by 14 ContestChest.com members. 10% of those who opened the contest, entered it.